Leaving aside the obvious attraction of wood-roasted coffee for the moment, Speckled Ax stands on its own as a coffee shop. On the north side of Congress Street, roughly equidistant between Bard Coffee to the east and Tandem Coffee + Bakery to the west, Speckled Ax catches the sun throughout most of the day. From the street, it looks as if the door is in the centre, with windows to either side. However, the right-hand window is for display only, so the door actually opens on the right-hand side, while Speckled Ax, long and thin, stretches out ahead of you. Immediately to your left is a small seating area, separate from the rest of the coffee shop, with benches along two walls and the window, surrounding a solitary coffee table made from an old tree trunk. Beyond this comes the remaining seating. On the left, there’s a row of four rectangular tables, with a bench against the wall. The first is a four-seater, while the others all seat two. On the right, where space is at a premium, three round tables, each with a pair of chairs, form a long line. Finally, there’s the counter, at the back on the left, in front of which is a three-seater table, perhaps the best seats in the house (although the window-benches have their attractions, particularly on a sunny day). The counter’s a two-part affair. The front, with espresso machine, three grinders and the cold-brew apparatus, faces the window, so if you’re sitting at the table, you can’t actually see what’s going on. The second part, which runs parallel to the walls, houses an impressive array of brewing kit. You can take your pick from syphon, V60, Chemex or Aeropress, although the Chemex is only for large volumes, the Aeropress is for coffee over ice, while the syphon has a large price-premium attached to it. So, for every day pour-over, the V60 is the main option. Opposite the filter kit is a set of retail shelves on the right-hand wall. Mention must go to Speckled Ax’s gorgeous tin ceiling, a particularly fine example of its ilk. This goes well with the wooden floor, wooden furniture and simple, plain décor. Although long and thin, multiple lights prevent Speckled Ax from getting too dark at the back. When it comes to coffee, Speckled Ax has an admirably concise (and dare I say European) coffee menu. Names are dispensed with and coffee is offered by size, the options for espresso with milk being 3oz, 6oz, 10oz and “too many oz”. I wholeheartedly approve! The single-origins on offer change every 7-10 days or so. When I arrived, I was feeling rather over-caffeinated, so tried the Chickadee, Speckled Ax’s decaf blend. At the recommendation of the manager, Megan, I had it as an espresso. This was served with a glass of sparkling water and proved to be a sweet, smooth coffee, which developed (pleasing) hints of sourness after the second sip. At this point, we were joined by Matt, the owner, who explained the history behind “Matt’s Wood Roasted Organic Coffee” and its evolution into “Speckled Ax”. He also insisted that I try a V60 of the Sumatra Ulos Batak single-origin, which turned out to be a glorious, full-bodied coffee that I took with me when I left. You can see what my friend and fellow coffee-blogger, Bex of Double Skinny Macchiato made of Speckled Ax when she visited in the summer of 2017. 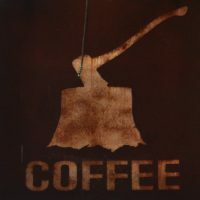 This entry was posted in Cafe/Roaster, Cake, Coffee Shops, Evening Opening, Laptop Friendly, Portland (Maine) and tagged include, PortlandPortland2015, Speckled Ax by Brian Williams. Bookmark the permalink.